Please contact Thames River Services directly to redeem your ticket using your iVenture Card. Please check at Thames River Services kiosk at St Katherine’s Pier outside the Tower hotel near the Tower of London. Closed Days Some services do not operate in January and February. Does not operate 24th-26th December, and 1st January. Any visit to London is incomplete without a cruise on the Thames and the Westminster to Greenwich Sightseeing Cruise is one of the best, allowing you to see all of London’s most popular sights. Once you arrive at your destination in Greenwich, you can hop off to visit all the maritime attractions, including the famous Cutty Sark. This cruise on the Thames River provides a comprehensive introduction to London. An informative audio commentary will give you a full running guide to all the sights along the way. Starting at Westminster, the route takes in the Houses of Parliament, the London Eye, Old Scotland Yard, the South Bank Centre, Cleopatra’s Needle, the Royal National Theatre, HMS President, St Paul’s Cathedral and many other attractions. Of course, this tour doesn’t end at Greenwich. Here, you can then disembark to take in all the maritime attractions, such as the Cutty Sark, the Royal Naval College and the famous observatory. If you don’t fancy the idea of braving public transport on the way home, you could always choose to take the trip back with the return boat and relax with a refreshment in the saloon or on deck. 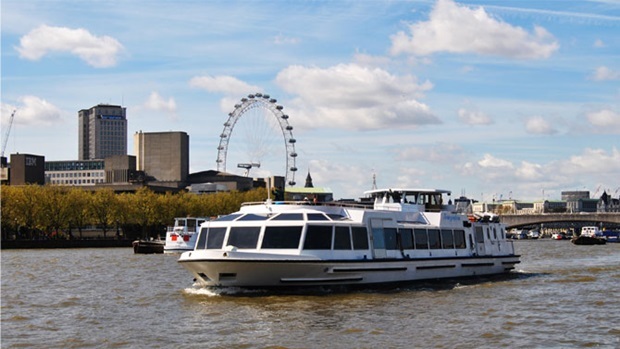 Passengers have the option to begin their trip either from Westminster Pier, St Katherine’s Pier (close to the Tower of London) or hop on the return trip back from Greenwich. All are easily accessible by London Underground and a number of London bus routes. The trip from Westminster to Greenwich takes about an hour. The return journey lasts two hours. Please arrive at the pier 15 minutes before the scheduled departure. The nearest tube station is Westminster (Central and District and Jubilee Line).